Is success as a consultant just a string of good luck? Some might think so… especially if their luck ran out and they ended up falling back on a job. But is it really just luck? Or do the ones who succeed in business embrace the mindset shift from being an hourly ‘order taker’ to a ‘trusted advisor’? Brennan says, yes — even if you’re relatively new to business. But with EBM (Education-Based Marketing) it’s easier to make this mindset change. And have clients booked several months in advance to work with you. 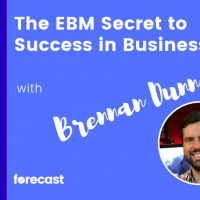 Find out more about the benefits of Education-Based Marketing in my enlightening conversation with Brennan Dunn.